Both social scientists and intellectuals draw on overarching sets of assumptions -- or paradigms -- to organize their efforts to understand our world, the goals we pursue, the ways we choose means to advance our goals, and the ways we relate to one another as we proceed as individuals or in unison. When these paradigms are used to formulate theories and policies that are limited in their empirical and ethical scope, the study of our world suffers, and so do efforts to administer to its ills. This book argues that the neoclassical paradigm -- that of a utilitarian-based version of radical individualism -- needs to be integrated into one that is more encompassing. After outlining the differences in the core assumption between the prevailing neoclassical paradigm (most noted, in the groundwork for neoclassical economics) and an emerging deontological paradigm (that of the I&We charted here), the differences between the two paradigms are explored from social philosophic, ethical, epistological, historical, and methodological viewpoints. Finally, ways to synthesize the two paradigms are indicated. The neoclassical paradigm is a utilitarian, rationalist, and individualist paradigm. It sees individuals as seeking to maximize their utility, rationally choosing the best means to serve their goals. They are the decision-making units; that is, they render their own decisions. The coming together of these individuals in the competitive marketplace, far from resulting in all-out conflict, is said to generate maximum efficiency and well-being. The notion of a community, to the extent that it is included in this paradigm, is often seen as the result of the aggregation of individual rational decisions. These utilitarian assumptions are found at the roots of neoclassical economics (for additional discussion, see p. 46). However, they play a key role in major theories in all contemporary social sciences. Since there is much more to neoclassical economic theory than these assumptions, and since the assumptions serve to form social science theories other than neoclassical economics, it seems useful to refer to them as a neoclassical paradigm. This paradigm plays a key role in contemporary political science (e.g., in the Public Choice school); in psychology (e.g., in the balance theory, which sees group members as continuously calculating the merit of membership rather than that of being "involved" or "committed"); in sociology (e.g., exchange theory); and even in anthropology (in works that argue that preliterate tribes conform to the laws of neoclassical economics, e.g., Schneider, 1974), history (e.g., North, 1981), and law (e.g., Posner, 1977). Moreover, the neoclassical paradigm plays a major role in our public policy, dialogues, intellectual life, and the social and political philosophies that the public embraces. While outside the social sciences, the terms used in public discourse to refer to the neoclassical paradigm have changed over the decades, currently the terms laissez-faire conservative and libertarian are most often used to refer to it. The neoclassical paradigm, and the theories formulated by drawing on its assumptions and core concepts, have been criticized as unrealistic, unproductive, and amoral (Malinowski, 1922; Parsons, 1937; Thurow, 1983; Allvine and Tarpley, 1977; Wilber and Jameson, 1983). However, the defenders of the neoclassical paradigm and theories can offer a strong response to these criticisms: They can challenge their critics to point to theories of behavior that are more productive than the prevailing one. "You cannot beat a theory with nothing," is more than a clever rejoinder -- it is a somewhat overstated but far from unfair comment on the state-of-the-art. Where do we go from here? The question concerns the way scientific and intellectual progress is attained. In this area we build on Thomas Kuhn's insight on the role and dynamics of paradigms. They provide an orderly way of organizing our thinking about a disorderly world. Developing a paradigm involves large investments that encompass many hundreds of thousands of human work-years, the expenditure of billions of dollars on data collection and analysis and elaboration of models, and the considerable effort entailed in reaching consensus, among those who share a given paradigm, about what one should assume the world is like. The magnitude of these investments provides a reason for holding on to vested paradigms. In addition, there are matters of ego-involvement and prestige pecking order that need not concern us here, and matters of ideological commitments to which we turn below. As long as there is no other productive paradigm, it is difficult to object to efforts to maintain the neoclassical paradigm, even if it encounters some so-called "stubborn facts" (facts incompatible with the theory), or other limited challenges (for instance, discovery of some internal inconsistencies). In fact, it is proper to attempt to shore up, augment, or modify the paradigm, and the theories that build on it, to absorb challenges, in the hope of avoiding a paradigm shift; it is also proper to preserve the mainframe of the prevailing paradigm -- as long as there is no successful alternative, even if these efforts cannot be successfully completed (or can only be completed by introducing far-fetched assumptions, or at the price of rendering tautological parts of the theory). So far, no such alternative seems to have arisen. As Ulen wrote (1983, p. 576): "...many of the most recent presidential addresses to the American Economic Association have been highly critical of received micro- and macro-economic theory. However, there has not yet been an offering of a new paradigm." If by a new paradigm he means one that is successful, able to provide a context to a wide array of evidence, and gain consensus, he is surely right. He goes on to recognize "the profession's quite natural attempt to plaster over the current paradigm's cracks with such ingenious fillers as transaction costs and rational expectations." (Ulen, 1983, p. 576.) While more than cracks have appeared in the facade, the procedure, to reiterate, is not merely "natural" but legitimate. Indeed, Ulen's own work further illustrates the point. After referring to a review of the literature by Nelson and Winter (1983, p. 577) that shows "the limited abilities of organizations and individuals to optimize," Ulen wonders if this is sufficient reason to replace orthodox theory rather than "merely patching it." Another student of the same challenge (Rubin, 1983, p. 719) wonders if this means that the neoclassical paradigm must be "scrapped," or that the new approach (in this case, evolutionary economics) can be absorbed into neoclassical economics, a procedure which he strongly prefers. Others try to evolve new paradigms. If and when such efforts are successful, it does not mean that the neoclassical paradigm will crumble. There have been several sciences in which two paradigms co-existed simultaneously in open competition for long periods of time. Marxism, after all, is a paradigm that does seek, among other things, to explain economic behavior. It long co-existed with the neoclassical paradigm, neither driving it out, nor being driven out by it. A major virtue of the prevailing neoclassical paradigm is that it states its core assumptions very clearly. This work progresses by changing these core assumptions and by exploring the consequences of such a change. Three basic changes are made concerning what people are after, how they choose their ways, and who is doing the choosing. Where the neoclassical assumption is that people seek to maximize one utility (whether it is pleasure, happiness, consumption, or merely a formal notion of a unitary goal), we assume that people pursue at least two irreducible "utilities," and have two sources of valuation: pleasure and morality (the subject of Part I). The neoclassical assumption that people render decisions rationally (by a definition to be clarified) is replaced by the assumption that people typically select means, not just goals, first and foremost on the basis of their values and emotions. Far from always "intruding on" or "twisting" rational deliberations, values and emotions render some decision-making more effective. This holds not just for social behavior, such as courtship, but also for economic behavior, say relationships with one's employees or superiors. The circumstances under which people do act the way neoclassicists assume they generally behave -- rationally (to one extent or another) -- are accounted for in the paradigm evolved here (the subject of Part II). The neoclassical assumption that the individual is the decision-making unit, is changed here to assume that social collectivities (such as ethnic and racial groups, peer groups at work, and neighborhood groups) are the prime decision-making units. Individual decision-making often reflects, to a significant extent, collective attributes and processes. Individual decisions do occur, but largely within the context set by various collectivities. These fundamentally different assumptions make up what is referred to here as the I&We paradigm (one of a larger possible set of deontological paradigms). The term highlights the assumption that individuals act within a social context, that this context is not reducible to individual acts, and, most significantly, that the social context is not necessarily or wholly imposed. Instead, the social context is, to a significant extent, perceived as a legitimate and integral part of one's existence, a We, a whole of which the individuals are constituent elements. The internalization of the social context, the partial overlap between the I's and the commons, is an essential difference between the neoclassical and the deontological paradigm evolved here. The neoclassical paradigm either does not recognize collectivities at all, or sees them as aggregates of individuals, without causal properties of their own, and as external to the person. The individual is viewed as standing detached from the community and from shared values, calculating whether or not to be a member, whether or not to heed the values' dictates. The deontological paradigm evolved here assumes that people have at least some significant involvement in the community (neoclassicists would say "surrender of sovereignty"), a sense of shared identity, and commitment to values, a sense that "We are members of one another." (Baldwin, 1902, p. 3.) Hence, adhering to shared values is often a matter not of expedient conformity but of internalization of moral values, at least in part (Wrong, 1961, p.186). In the same way that neoclassical economics is the flagship of the neoclassical paradigm, a theory referred to from here on as socio-economics is an attempt to provide a theory of economic behavior within our deontological, I&We, paradigm. The dialogue between the prevailing and the challenging paradigms builds on basic differences in social philosophy: the two positions contain divergent views of human nature (are people basically knaves or nobles?) and of social order (are individuals naturally harmonious -- or is man wolf to man?). While not every neoclassicist who works on wage differentials or saving rates subscribes to the social philosophy of Adam Smith's invisible hand and to its laissez faire implications, these concepts obviously lie at the base of the prevailing neoclassical paradigm. Sociologists refer to the implied view of the person as "undersocialized" because individuals are assumed to be the effective actors, able to act independently and to be psychologically complete unto themselves. It is a view of the social order as resting on the marketplace, as basically composed of individual transactions (even if those are of households and small firms), and as basically self-regulating. The state has a minimal and negative role. If this view recognizes the role of the community at all, it plays no role in the main frame of the paradigm. "The community is a fictitious body, composed of...individual persons". (Bentham, 1960 Chapter 1, paragraph 2.) Here lies the deeper root of the view of economics not as a science that deals with goods and services but with the logic of choice (Barry, 1978, p. 5). Whose choice? Neoclassicists answer: That of unfettered individuals (Granovetter, 1985). The historical roots of this social philosophy of radical individualism explain much about its slant. It was promulgated and advanced by an intellectual and political movement referred to as Whigs (in those days, "liberals"), in opposition to an authoritarian monarchy and a tightly woven society that imposed its moral code via the established religion (Guttridge, 1942). While Whigs embraced many other ideas, the essence of their position continues to have influence in contemporary social sciences, in intellectual circles, and in the public-at-large, long after the historical circumstances against which the original Whigs railed had vanished. Leading contemporary Whigs include Friedrick Von Hayek, Milton Friedman, and Robert Nozick. Historically, the main challenge to the Whig's worldview, that underlies the neoclassical paradigm, has been not the recent liberal notion of a significant and positive role of the state, but the social-conservative, Tory, view that considers community and authority as social foundations. Here the nation, the fatherland, the church, or society take priority over the individual. While laissez faire Whigs perceive the state to be created by individuals, for individuals, Tory conservatives view the community as a body into which individual cells are incorporated. Individuals are assumed to be born with unsavory predispositions and not at all inclined to live harmoniously with one another. They must be inoculated with values to develop their moral character, and authority is needed to keep on the lid of social order. The danger of mob anarchy is seen as greater than that of authoritarianism. Sociologists refer to this collectivist "Tory" view as the "over-socialized" view of human nature (Wrong, 1961). Historically it preceded the Whigs; it was the medieval social philosophy of the church and the monarchy, that, at the onset of modernity, argued against claims for individual rights and those of new, rising classes. It is at the root of Emile Durkheim's main works, Talcott Parsons' sociology, some branches of political science (especially that of Leo Strauss), and a good part of anthropology. For Parsons, the core concept is functionalism: the acts of individuals are, in effect, evaluated in terms of their contribution to the social order, which in turn is introduced into the individuals via socialization, and reinforced by social control. These concepts do not exactly parallel but reflect the notions of a strong community (focused around one set of ultimate values, drawing on tightly knit social relations) and a potent state (to reinforce the values of the community). Typically, authority in this context is viewed as legitimate power. A wit suggested that while economics shows us how to make choices, sociology shows us that we have none. That is not quite a correct rendition of the two disciplines, but it does apply to the ideal type of Whig and Tory positions. The centuries-old tug-of-war between these Whig and Tory worldviews, and their effects on social science paradigms, are far from defunct. See, for example, the treatment of trust. Trust would seem at first to be one of those typical Tory social-scientist concepts that Whigish economists may assume exist but need not bother to explain (Luhmann, 1979). Trust, of course, is pivotal to the economy, and not merely to social relations, as, without it, currency will not be used, saving makes no sense, and transactions costs rise precipitously; in short, it is hard to conceive a modern economy without a strong element of trust running through it. But when one asks what accounts for the extent to which individuals do trust one another, and for the level of trust in society, the differences between the two worldviews come into sharp relief. Tory social scientists have a simple answer: Trust is a value with which youngsters are inoculated by their "socialization agents" (parents, educators, peers). Those who violate the value are either re-educated to embrace it, or punished until they abide by it, and others are deterred from transgressing. Whigish economists see trust as arising out of previous transactions, based on rational calculations and efficient "rules of thumb." For example, if A is your customer, and you verified his credit worthiness for the last N transactions, it is rational to skip checking it the N + 1 time (assuming the transactions are relatively small and the costs of checking are relatively high). Thus, to Whigs a high level of trust reflects not successful socialization but either numerous prior reiterations, small stakes, or high verification costs. The differences in perspective, illustrated by their perspectives on trust, hold for a myriad of other such concepts encompassed by the two paradigms. This volume seeks to advance a third position. Its social philosophical foundation may be characterized as the responsive community, or, in deference to my master-teacher, Martin Buber, the "I&We" view. At the core is the assumption of creative tension and perpetual search for balance between two primary forces -- those of individuals, and those of the community, of which they are members. If one views the community as merely an aggregation of individuals temporarily joined for their convenience, one leaves out the need for commitment to serve shared needs and for involvement in the community that attends to these needs. If one sees the community as the source of authority and legitimacy, and seeks, in the name of duty, to impose behavioral standards on individuals -- and on oneself -- this leaves an insufficient basis for individual freedom and other individual rights. It also prevents the community from being creative and responsive to a changing world, by constricting the evolution of differing positions, which could in time replace the community's dominant values, thereby benefitting it. The term responsive community is used to accord full status both to individuals and to their shared union. A responsive community is much more integrated than an aggregate of self-maximizing individuals; however, it is much less hierarchical and much less structured and "socializing", than an authoritarian community. We need to reject the Hobbesian notion that individuals must subordinate their basic rights as a prerequisite for security. Threats to security are not so high as to require that we all yield to the Leviathan to shield us. Nor can we build on the Lockeian notion that all rights are vested in individuals, who may or may not wish to delegate some of these rights, on the basis of their deliberations, to a community. Individuals and community are both completely essential, and hence have the same fundamental standing. From this synthesis there results an unavoidable, indeed a deeply productive tension between the two basic elements of the responsive community. Individuals may pull to diminish the community; the community may pull excessively to incorporate individuals. But if neither element gains ascendancy, and if the excesses of one are corrected by shoring up the other, a balanced, responsive community may be sustained. Schopenhauer is credited with the aphorism that people are like porcupines in the cold: They freeze if they get too far apart, but stick each other if they get too close. While it is possible to think abstractly about individuals apart from a community, if individuals were actually without community they would have very few of the attributes commonly associated with the notion of an individual person. Such individuals typically are mentally unstable, impulsive, prone to suicide, and otherwise mentally and psychosomatically ill (Srole, 1975). Certainly such isolated individuals have little in common with the level-headed maximizers assumed by the Whigish neoclassical paradigm. The I's need a We to be. The significance of viewing individuals as members of social collectivities (such as ethnic groups and local communities) rather than as freestanding beings, is highlighted by the different treatment accorded to liberty in the neoclassical and the I&We paradigms. At the core of the neoclassical paradigm is the assumption that freestanding individuals are the decision-making unit, the actors. This is much more than a working hypothesis; it is an article of faith grounded in a deep commitment to the value of liberty. Neoclassicists argue that if one assumes that the preferences of individuals can be manipulated or changed by social forces, one undermines the foundations of liberty -- the notion that each individual is able to render decisions on his own. This is the reason neoclassicists assume that preferences are given, why they ignore the effects of education, of persuasion (including persuasive advertising), and the role of leadership, as if economic man was a biological-psychological miracle, born fully formed, say in his mid-twenties (Maital and Maital, 1984, p. 65) with his preferences "immaculately conceived" (as Kenneth Boulding put it to a 1985 George Washington University Seminar on socio-economics). The same commitment to liberty is at the root of the assumption of consumer sovereignty and the tendency of neoclassical economists to disregard the role of class, power, and societal structures. Typical neoclassicists argue that people know best what is best for them, and hence should not be interfered with by the government. However, to recognize that people preferences are in part socially shaped is not to argue for a government to make decisions for them, but to acknowledge the need to deal in one's theory with significant historical, cultural, and societal forces. Only when these are allowed into one's paradigm can a systematic search begin for the conditions under which liberty may be protected from -- or enhanced by -- these forces. The insights and findings of psychologists and sociologists indicate that individuals who are typically cut-off and isolated, the actors of the neoclassical world, are unable to act freely, while they find that individuals who are bonded into comprehensive and stable relationships, and into cohesive groups and communities, are much more able to make sensible choices, to render judgment, and be free. Indeed, the greatest danger for liberty arises when the social moorings of individuals are cut. The atomization of the individuals, the reduction of communities into mobs, which resulted in the individuals' loss of competence, of their capacity to reason, and their self-identity (Kornhauser, 1959; Fromm, 1941) is the societal condition that has preceded the rise of totalitarian movements and governments. The best protection against totalitarianism is a pluralistic society laced with communities and voluntary associations, as observed so keenly by Alexis de Tocqueville. The I&We paradigm is as much concerned with individual liberties as is the neoclassical. However, it assumes that liberty requires a viable -- albeit not overbearing -- community, and seeks to study the conditions under which such a community evolves and is sustained. As we see it, individuals are neither simply depositories of their society's values nor free agents. They struggle to form their individual course, both building on and fending off the values their societies set, never free of them, yet never mere subjects. Similarly, on the macro or societal level, competition is beneficial as long as it is properly embedded in a supportive societal context, which ensures that the prerequisites of competition are met while limiting its scope. That is, social order is not the result of imposition by authority, or an aggregation of individual pursuits, but a community setting within which people are free, and without which they are not, and within which they continuously vie over the borderline between freedom and order. While some individuals may be over-socialized, say, to the point they loose their self-identity and self-control in the We of a charismatic social movement, while some others are undersocialized, often deviant, criminal or insane -- society requires a balance, and builds on properly socialized individuals. These individuals balance shared and self needs, respond to internalized values but are also able to calculate consequences. To be properly socialized does not mean that one is unable to compete, act rationally, or to be self-oriented; there are areas in which such behavior is compatible with the community's values. However, in each such area there are moral limits beyond which such behavior may not be carried (for instance, those imbedded in the "rules of the game," in sports, politics, and in the economy). And, there are significant differences among sub-areas of behavior as to the appropriate mix of the two modes (e.g., within the family or among friends, vs. at work). Hence, it might be useful to think about competition/cooperation ratios, and ratio differences among areas of behavior, noting that proper socialization never favors all-out competition. The ethics that underlie the neoclassical paradigm are utilitarian. While not all utilitarian philosophies are hedonistic or self-centered, the neoclassical paradigm is both. (For documentation and qualifications, see Chapter 2). Typically, the paradigm assumes a unitary self, that the person is a bundle of unambiguous and stable preferences (March, 1978, pp. 595-96). Moreover, the person is seen as a black box, responding to changes in the environment (in inputs or in constraints) rather than to internal processes or structures. In contrast, the I&We paradigm assumes that individuals experience perpetual inner tension generated by conflicts among their various basic urges (or desires), among their various moral commitments, and between their urges and their moral commitments. John W. Gardner Former Secretary of Health, Education and Welfare The Moral Dimension: Toward A New Economics is at the leading edge of social thought in this country. It may be the most important book of the year. Alan Lewis Journal of Economic Psychology This is a book I will keep close to my desk and refer to often. It is packed with ideas eloquently expressed, if something new is to happen in economics (i.e., the emergence of a more behavioral, social, psychological economics), because of its wide appeal, this book will rank high among those providing the necessary momentum for change. Aaron Wildavsky University of California, Berkeley A seminal work that will help change our ideas about how the world works. Harvey Cox Harvard Divinity School Shows that unless economics and moral values are considered together, we will understand neither. 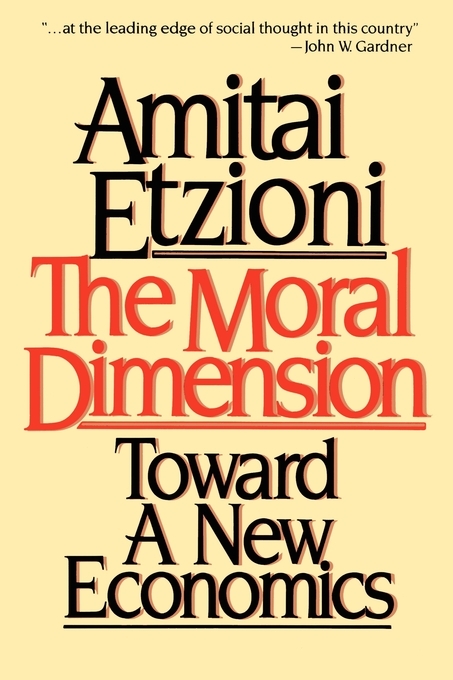 Etzioni has built a sturdy bridge not only between economic theory and the humanities, but between economics and the entire cluster of disciplines that deals with human valuing and choosing. Although he signals some real dangers in continuing to apply outmoded rationalistic models, he also sketches the encouraging vision of a new economics that is once again integrated into a wider human enterprise.